World Energy, and Hydrogen as the Universal Mediator Energy is the fuel of modern civilization, a vital part of the society in which we live. Most of the major advances in the history of civilizations have been coupled with new and better uses of energy sources -- first wind and water power, then steam power from combusting coal, internal combustion engines, and more recently electricity-based machines using increasing percentages of renewable energy. The HydroSolar Package described here is an evaluation of credible sources of energy for whole-planet use in the near and middle future. It is shown that solar energy is the only source known at present capable of meeting continuing and expanding demand. The amount of solar energy available is far above man's current needs and will be available without charge for millions of years to come. This article also explains the importance of Hydrogen as the mediator and intermediary of our future energy use. 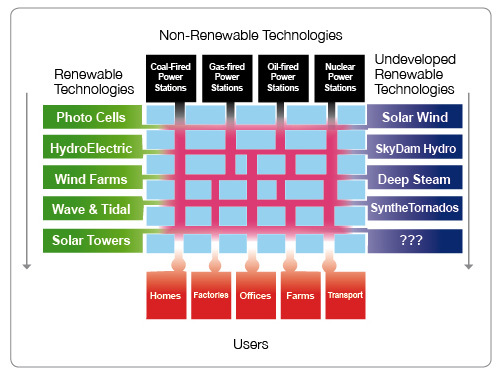 At present our energy uses are greatly fragmented and localized in their usage and application. A common intermediary at present is electricity, which is distributed in small and larger areas through "Electricity Grids", mostly run by quasi-governmental utilities. There is a better way, through the use of the "HydroWeb" as described below. The ultimate major source of energy for the world is the Sun. Solar energy impacting on the Earth amounts to about 1.785 E14 kW , the equivalent (for a world population of 6 billion) of a continuous power supply of 30,000 kW per person. Diverting off only one thousandth of this power to human use, 30 kW per head, will provide well in excess of human needs without any disruption to planetary processes. No other amply large, long-term source of energy for mankind is known at present. Prices for energy provision depend on all the infrastructures involved in particular industries, and on supply and demand. Prices are likely to increase because demand often exceeds supply. Who's using the energy? To get an idea of who is using the world's human-captured or human-generated energy, look at this graph of population and energy usage for a selection of countries . Figure HY400-F1. 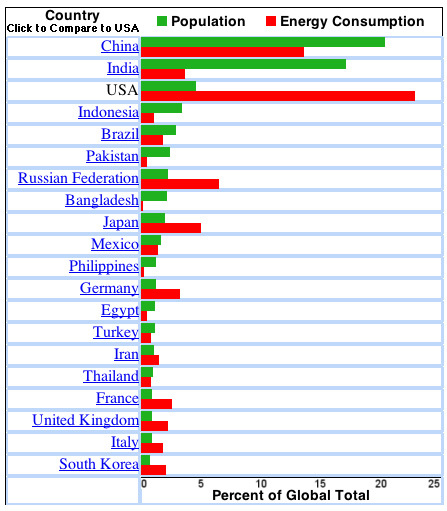 Energy consumption and populations of some countries. From . Clearly some countries are much heavier users of energy than others. 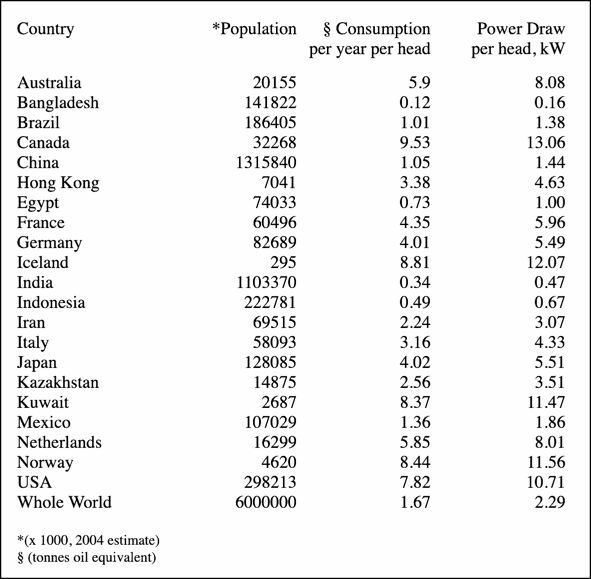 The following table shows data from, converted  to show per-head power draw for these same countries and for the whole world. The units are in kilowatts (kW). The table was constructed in 2006. Estimated 2004 populations are also given. Table HY400-T1. Populations and energy consumption rates for sample countries. Based on . To give a feel for what these figures mean, 2 kW is about the energy drawn by a 2-bar electric fire. A medium-size car draws around 100 kW while in motion, and a small 1-room air conditioner around 1 kW. This is as though every person in the world used all their supply of energy by running a 2-bar electric fire all year. But many countries have an average power draw much higher than this -- in the USA the figure is almost 5 times the world average. What does all this Mean for Future World Energy Supply? By and large, a country's energy use reflects its state of development. More "advanced", more "developed", countries use more energy per head than less developed ones -- in Bangladesh, the energy draw is much less than one-tenth of the world average. We can't hold back countries like China from developing -- the general world view is that we should encourage 'less-developed' countries to improve their levels of health, education, and standard of living. There is really only one practical source for future energy needs, and that is solar energy. The average Planet Earth inhabitant draws just over 2 kW, an American draws over 10 kW. But the sun provides around 3000 kW per person! . This electricity needs to be carefully regulated, as to voltage and amperage, to suit the requirements of the particular instant of use. Methods of storing electricity exist, as in giant batteries or potential-energy storage, but these are relatively capital-demanding and inflexible. There is an examination of energy storage in DS903: The KPW (Kilogram Power Wheel), a domestic power storage device replacing batteries . The HydroSolar Package uses a different approach. In this, all energy sources are either natively in the form of hydrogen, or are turned directly into hydrogen through electrolysis or its analogues. This hydrogen is fed into an ultimately all-embracing network of pipes, the HydroWeb, extending to all end-users -- similar to existing natural-gas or oil pipelines, but with much greater reach and complexity. As a fuel, hydrogen has a high calorific value, yielding about 2.8 times as much energy as an equivalent mass of gasoline . So instead of a tank holding 70 kg of gasoline motor fuel, a car running on hydrogen combustion could run a similar distance using only 25 kg of hydrogen. Because of its high energy value, liquid hydrogen is the normal fuel for launching spacecraft. According to , there are no natural hydrogen deposits, but hydrogen is required for essential chemical processes. Therefore, the production of hydrogen plays a key role in any industrialized society. The hydrogen generation market was valued at $115.25 billion USD in 2017. Millions of tons of hydrogen were consumed on-site in oil refining, and in the production of ammonia and methanol. There are four main sources for the commercial production of hydrogen -- natural gas, oil, coal, and electrolysis, which account for 48%, 30%, 18% and 4% of the world's hydrogen production respectively. Fossil fuels are the dominant source of industrial hydrogen . Bulk hydrogen is usually produced by the steam reforming of methane or natural gas, the cheapest source of hydrogen currently. In 1999, the majority of industrial hydrogen (about 95%) was produced from fossil fuels by steam reforming, with only a small quantity by other routes such as biomass gasification or electrolysis of water. Around 8 GW of electrolysis capacity was installed worldwide, accounting for around 4% of global hydrogen production. Developing affordable methods for producing hydrogen with less damage to the environment is a goal of the hydrogen economy. The above-mentioned sources of industrial hydrogen are nothing to with hydrogen for the HydroWeb, they only concern the hydrogen needed for certain industrial uses, which is quite a separate topic. It is only mentioned here because it has sometimes been convenient to abstract some of this industrial hydrogen for use in fuelling vehicles. In fact, using industrial hydrogen in the HydroWeb is to be strongly discouraged, because of the risk of contamination with other gases. Hydrogen to be used in the HydroWeb should only come from sources (such as electrolysis), which are naturally pure and have no possibility of contamination with other gases such as methane or carbon dioxide. Making Hydrogen from Electricity The standard method of converting electricity into hydrogen is electrolysis. In this, electric current is passed though water or an aqueous solution between two electrodes, separated by a partition of some sort. The water is split by the current into hydrogen, collecting at one electrode, and oxygen, at the other. Figure HY400-F3. 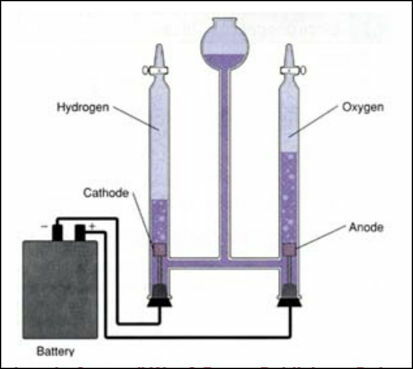 Diagram of electrolysis. From . There are also other possible methods, some mentioned in . It may be possible to design small solid-state units which combine photocell energy collection with electrolysis, feeding hydrogen directly into the HydroWeb. With no moving parts, banks of such units could be deployed anywhere with a HydroWeb connection, and could function without attention or labour input for months on end, as long as they could draw on a water supply. No pump needed A feature of electrolysis means that the HydroWeb needs no pumps, no equipment with moving parts, and can be essentially automatic. This feature is that the current used in electrolysis can operate to force the hydrogen into a space already under pressure. The solar cell acts as its own pump, and cells can be added at points along the HydroWeb specifically to act as pumps by injecting more hydrogen. Making Hydrogen directly from Sunlight Currently more and more energy is being harvested from the sun using solar panels, which produce electricity. Research is underway to make simple devices which combine solar energy trapping and electrolysis, so that solar panels with a water supply yield hydrogen directly. Even more promising are devices now appearing on the market which produce hydrogen directly from the action of sunlight on water. These may involve special catalysts which promote the splitting of water into hydrogen and oxygen under the action of light. They may be called HSCs (Hydrogen Solar Cells). Figure HY400-F4. A Hydrogen Solar Cell (HSC), making Hydrogen from sunlight. From . The HSC shown in Figure 4 above incorporates solar cells and draws water from the surrounding air . The panel generates as much as 250 litres of hydrogen per day, and could be used to provide local electricity and heating on the cheap. 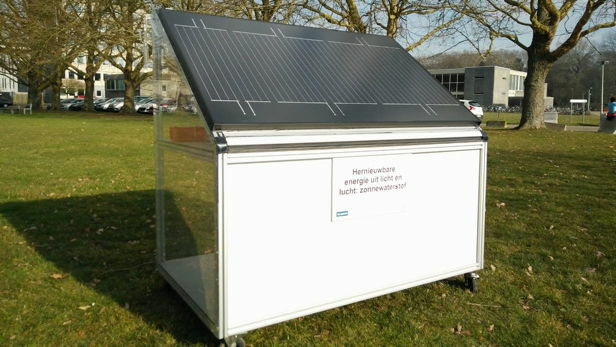 Developed by scientists in Belgium , the researchers estimate that an array of 20 such panels, paired with an underground pressurized tank, could provide the totality of a household's entire electricity and heating needs for a modest price. The direct product from solar cells, wind farms, hydroelectric stations, wave energy capture, and many other renewable sources, such as geothermal energy, is normally electricity. Of course our normal 'power stations' also produce electricity, but not renewably. In the HydroSolar Package, all novel and conventional electricity generation stations would be eventually be converted so their electricity was turned into hydrogen for pipeline transmission to the user. It can be anticipated that most countries burning fossil fuels for electricity production will ultimately shift to renewable-energy sources. Iceland currently produces 100% of its energy from renewable resources, and is being chased closely by Sweden, Costa Rica. Nicaragua, and the United Kingdom . In Australia, a 2006 ABC Television program, "Solar Future" , gave a good review of advances in solar energy production. Here is a short quote from this. "Our reliance on greenhouse gas emitting coal-fired power stations is unsustainable. Solar power is an obvious alternative choice for sun-drenched Australia, so why aren't we already living in a solar economy? There are a number of promising technologies being developed and the solar future may be about to arrive". Among the many promising techniques, one is the Solar Updraft Tower, a giant flat greenhouse structure with a tall central tower. This incorporates a heat-store under the greenhouse in the form of soil or other material, and so is not as daylight-dependent as solar cells. A solar updraft tower is a renewable-energy power plant, first proposed in 1903 . It combines three proven technologies: chimney effect, greenhouse effect and wind turbines. Air is heated by sunshine and contained in a very large greenhouse-like structure around the base of a tall tower; the resulting convection causes air to rise up the updraft tower. This airflow drives turbines, which produce electricity. n 1982, a small-scale experimental protoype of a solar updraft tower was built in Ciudad Real, 150 km south of Madrid, Spain. The power plant operated for approximately eight years. The updraft tower's guy-wires, which were not protected against corrosion, weakened due to rusting and failed in a storm. This caused the tower to fall over, and the plant was decommissioned in 1989. Figure HY400-F5. An actual Solar Updraft Tower built in Spain. From . This was an experimental setup that did not sell energy to produce income. Inexpensive materials were used in order to evaluate their performance. 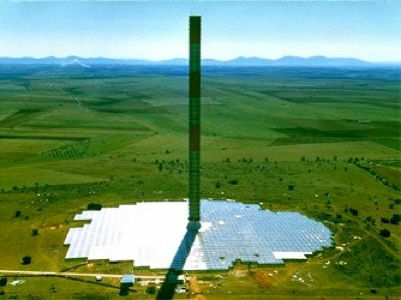 The solar tower was built of iron plating only 1.25 mm thick under the direction of a German engineer, Jorg Schlaich, and was funded by the German government. The chimney had a height of 195 meters and a diameter of 10 meters with a collection area (greenhouse) of 46,000 sq. metres and a diameter of about 244 m, obtaining a maximum power output of about 50 kW. Different materials were used for testing, such as single or double glazing or plastic, and one section was used as an actual greenhouse, growing plants under glass. During its operation, optimization data was collected on a second-by-second basis, with 180 sensors measuring inside and outside temperature, humidity and wind speed. 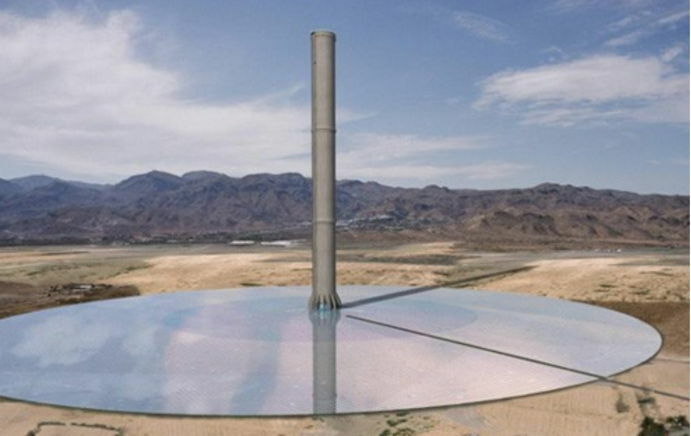 The Australian company EnviroMission has a proposal to build the world's tallest solar updraft power plant, or chimney, in Arizona . With an 800-metre tall tower that would be the centrepiece of this giant non-polluting power plant, it would be the second tallest structure on the planet (as of 2011). 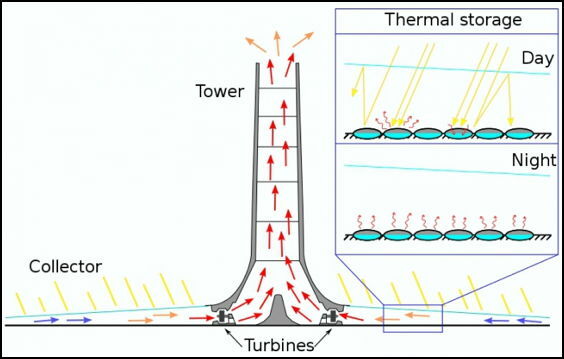 The generating ability of a solar updraft power plant depends primarily on two factors: the collector area and the chimney height . With a larger collector area, a greater volume of air is warmed to flow up the chimney. Collector areas as large as seven kilometers in diameter have been considered. With a larger chimney height, the pressure difference increases the stack effect; chimneys as tall as 1,000 meters have been considered. The EnviroMission tower was expected to be completed in 2015 and would provide enough electricity to power the equivalent of 200,000 homes. A quite different sort of energy-producing structure is the Heliostat Solar Tower. This consists of a vast array of computer-controlled mirrors which reflect sunlight onto a water-supplied boiler on top of a tower. Figure HY400-F7. Heliostat Solar Tower. From . Heliostat Solar Towers have been built and are already part of the commercial power-generating picture. The foremost country in this regard was Spain . In 2016, Spain's cumulative total solar power installed was 6,969 MW, of which 4,669 MW were solar PV installations (conventional solar panels) and 2,300 MW were CSP (concentrated solar power or heliostats). In 2016, nearly 8 TWh of electrical power was produced from photovoltaics, and 5 TWh from CSP plants. In 2016, having promoted the solar industry with large government subsidies during earlier periods, Spain turned the solar power industry on its head by withdrawing contracted feed-in tariffs and applying a punitive "solar tax" to new photovoltaic plants . Spain has been cited as a model in "how not to" develop renewables. As a legacy from Spain's earlier development of solar power, the country remains a world leader in concentrated solar power, accounting for almost a third of solar power installed capacity in the country, a much higher ratio than that for other countries (as of 2017) . Many large CSP (concentrated solar power) stations remain active in Spain and may have provided some of the impetus for large CSP developments in neighbouring Morocco. A major CSP project, expected to be in commercial operation by the end of 2017, is under construction in Israel. The 250-metre high tower of the Heliostat stands in the middle of a 121-megawatt concentrated solar complex in Israel's sun-drenched Negev desert , as shown in Figure F7. The Ashalim Solar Thermal Power Station, built and operated by Megalim Solar Power Ltd, consists of more than 50,000 computer-controlled heliostats, or mirrors, that track the sun and reflect its rays onto a boiler on top of the tower. The boiler creates superheated steam that then feeds a steam turbine for power generation. Like other concentrated solar power (CSP) plants, the beauty of the Ashalim complex is that it's designed to produce energy even when the sun isn't shining. "Compared to solar photovoltaic (PV) applications, direct steam CSP has the advantage of being able to produce electricity for longer periods of time during the solar hours," General Electric, a Megalim shareholder, explained in a brochure. "The ability to operate during peak demand times reduces the need for utilities to build power plants to operate only during peak times -- thereby lowering the overall system's electricity production costs". It's important to note that the electricity produced from most renewable sources is inherently variable. When the sun does not shine, the wind does not blow, or the water behind the dam drops, the electricity produced will diminish or cut out. A further huge advantage of the HydroWeb is its stability and reliability -- with it, power cuts, dropouts, and brownouts should be a thing of the past. Equipment at the usage point can still fail, but supply to a usage point can be through duplicated pipelines, as in a ring main, since there is no need to match voltages and phases. The HydroWeb also has much better potential safety than the present set-up -- unshielded high-voltage power lines suspended in the air have been responsible for many tragedies. Storing Domestic Hydrogen The report on the HSC (Hydrogen Solar Cell) mentioned above and shown in Figure F4 noted  that it could be paired with an underground hydrogen tank to make a household independent of outside energy supplies ("The Grid"). The report notes that "The advantage of this approach is that large amounts of hydrogen can be stored in an underground pressurized tank (at a pressure of approximately 400 bar) without the inevitable losses in capacity that come with battery technology. Using fuel cells, the reserves from the tank can then be converted at will into heating, electricity, or fuel for a hydrogen-powered car with a 90 percent conversion efficiency". Another report on the same project  says "Going solar comes with a couple of significant drawbacks, particularly when it comes to managing your reserves. First, storing an energy buffer for a rainy day is all but cheap: a home battery pack will run you up thousands of dollars, and its charge will keep you off the grid for a few extra days at most. Secondly, lithium-ion batteries lose capacity with use, and slowly self-discharge with disuse". The report suggests use of the Hydrogen Solar Cell and a local hydrogen tank is a cheaper green alternative to batteries. The researchers noted that they wanted to design something sustainable that is affordable and can be used practically anywhere, using cheap raw materials without the need for precious metals or other expensive components . With the HydroWeb system, the local hydrogen tank sits at one side of the vast hydrogen pipeline network. The network can be drawn on to fill the tank, if it becomes depleted. Or if an excess is being produced locally, hydrogen can be fed back into the network. As only a pure material, hydrogen, is involved, this can be done automatically through pressure valves, with simple metering devices working out whether you are in "debit or credit" with the HydroWeb. 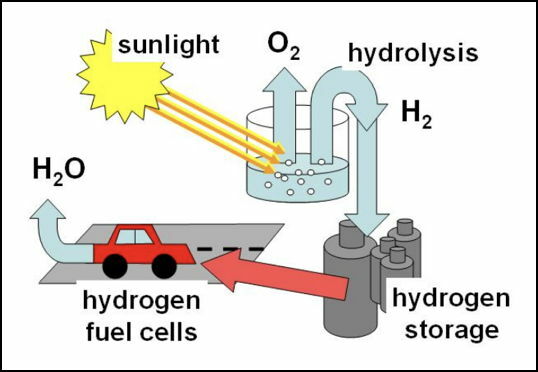 The Sunlight-Hydrolysis-Hydrogen-Fuel Cell Process Putting together the various components, we end up with a process by which we run cars and other energy-demanding devices on sunlight. Figure HY400-F8. Hydrogen from sunlight diagram. From . Transmission losses in electricity lines are very significant. If you use a couple of long extension leads, say 100 metres or more, with a domestic power supply you may find that the voltage at the usage end has dropped too low to activate the machine you want to plug in. Using higher-voltage transmission lines allows transmission for longer distances, but energy losses are still substantial. Losses from hydrogen transmission pipes can be made insignificant. In the early development of the HydroWeb, hydrogen would be fed directly to existing power stations and used in place of their current fuels -- even, (if they have gas-turbine generators), their current equipment. This is a simple large-scale application. Figure HY400-F9. 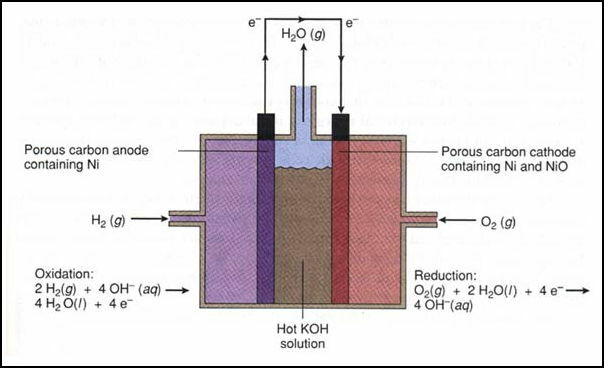 Schematic of a Fuel Cell. From . In the final stage, hydrogen would be supplied to individual homes, again replacing (domestic-voltage) power cables, with each home having its own automatic fuel cell to provide its electricity needs. Once available at the domestic level, hydrogen from the HydroWeb could supply all the home's energy needs. Hydrogen would be used to fuel gas stoves, water heaters, and other heating supplies, often with little or no modification to existing equipment. Of course the HydroWeb would eliminate the need for unsightly power lines and towers, and be much safer -- not liable to electrocution deaths and much less liable to damage from storms, accidental contact, and all sorts of natural disasters. As long as the pressure in their buffer tank was higher than that at their HydroWeb access point at a given moment, the user could vent some hydrogen back into the Web, which would run their meter backwards. The whole thing could be self-regulating, easily accommodating the various loads from and to the HydroWeb. Transport and Vehicles In my home town of Perth, Western Australia, the WA Government has trialled some fuel-cell powered buses. Here is a write-up from . "As part of the Western Australian Government's commitment to working towards sustainable transport energy solutions in Western Australia, a number of initiatives are being introduced to encourage the development of clean fuels. Since September 2004, Perth has been participating in one of the first major trials of hydrogen fuel cell buses in the world. Three Daimler Chrysler hydrogen fuel cell buses will be trialled on normal Perth service routes for two years. Participation in the trial brings Western Australians close to the global development of this exciting technology, and will allow us to fully evaluate the potential of hydrogen and fuel cells as one of the possible transport energy solutions of the future". is unloaded from the ship, with the pure steam rising from its exhaust pipe visible at the rear. From . According to , DaimlerChrysler's Nebus stores 24 kg of H2 in pressure tanks on the roof, and has a driving distance of 270-290 km. The fuel cells produce 250 kW and take up no more space than a similar diesel engine does. Figure HY400-F11. The Ford P2000. From . Of course hydrogen fuel cells can also be used in cars. In  it notes that "the P2000 has the same fuel efficiency as today's Ford Taurus. It has an acceleration speed of 0 to 100 km/h in twelve seconds. The hydrogen car has a fuel-cell stack that can generate 90 hp. The hydrogen in the Ford car shown here is stored compressed in a pressure tank. The P2000 is constructed in lightweight materials such as aluminum, magnesium, and plastic in order to achieve the best fuel efficiency. Ford is developing its fuel-cell cars in collaboration with Ballard Power Systems and DaimlerChrysler. The P2000 will be out on the market in 2004." 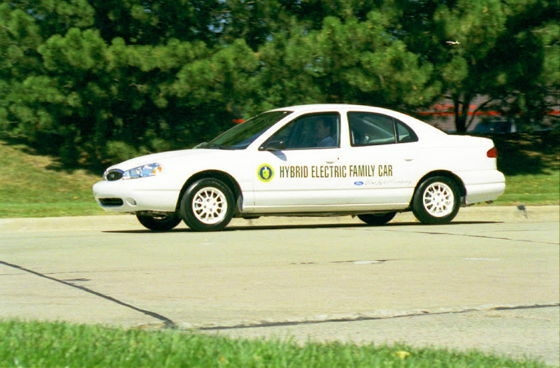 Private cars powered by fuel cells have been available since 2005. At the time of writing the first version of this article (2006), there was no network of hydrogen supply points. As at 2019, hydrogen has become available at service stations networks in California, with networks planned in other countries also. Figure HY400-F12. 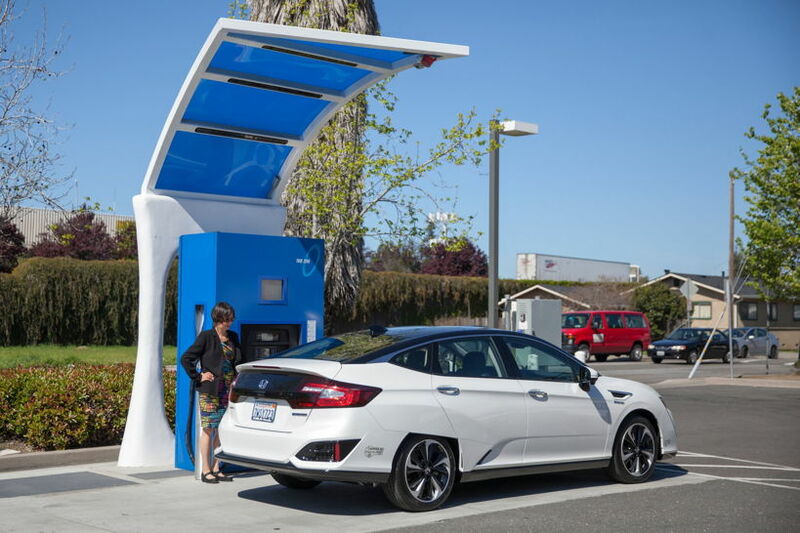 Hydrogen refuelling station in Hayward, California. From . When the HydroWeb is in the earlier stages of development, it can be used to supply service stations. Later, users may draw hydrogen from their own domestic buffer tanks.. Conventional internal-combustion cars can also be run with hydrogen. In Western Australia, government subsidies of up to $3000 were available to private car owners to fit LPG (liquified petroleum gas) tanks to their vehicles. Most service stations here now offer this supply. Different sorts of tank would be required to use hydrogen instead of LPG, but the internal combustion engines themselves would need little change to run on hydrogen. In Great Britain during the Second World War, when private motorists could not buy petrol, one could occasionally see a private car fuelled by town gas, held in a gas bag on the roof. Town gas, available even in wartime, was made from coal and piped to homes. Wood-gas generators (producing gas by destructive distillation of wood) have been widely used to fuel cars in times when conventional fuels were scarce, although the gas produced was very dirty. on the Airbus 320. From . "The only disadvantage compared with kerosene jet fuel is that hydrogen has a lower density and therefore requires larger fuel tanks. In 1956, a B57 was flown with LH2, and in June of 1989, a Cheetah was flown using only hydrogen. Airbus is working with Russian Tupolev on building a hydrogen-driven airplane; testing of the plane will begin in the year 2000. 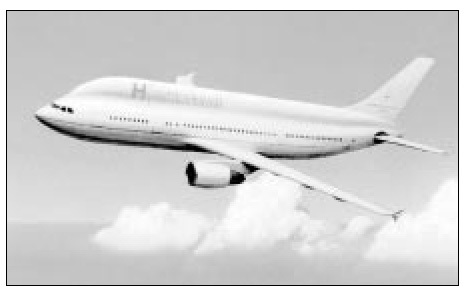 Airbus has plans for the commercial sale of hydrogen-driven passenger airplanes from 2005-2007 [Daimler Benz Aerospace/ (Airbus)]. Boeing has also indicated that they have designs for building a hydrogen-fueled airplane." Figure HY400-F14. 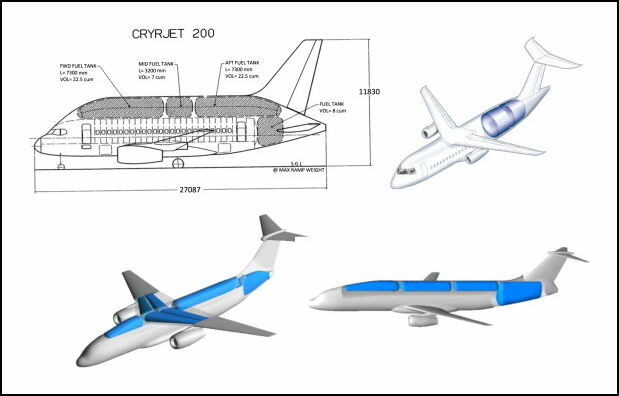 Designs for hydrogen-powered aircraft. From . There is much present concern with the build-up of carbon dioxide in the atmosphere. While I have put forward evidence  indicating that this build-up is not a source of global warming, replacing fossil fuels with hydrogen must alleviate such concerns. Hydrogen is Very Very Safe The safety of Hydrogen usage does weigh on people's minds, but in fact it is far safer than current vehicle fuels such as gasoline/petrol. While hydrogen is a fuel and so can burn, it is not liable to explode like gasoline can. It won't even ignite unless mixed with air. Hydrogen cars can't explode like the gasoline-powered cars seen in every Hollywood car chase. Hydrogen got a bad name after the 'Hindenburg Disaster', when a giant German airship filled with hydrogen caught fire and crashed in 1937, with some loss of life. However, the circumstances were very unusual (the airship was tethered to a mast in bad weather after an electrical storm), and the accident was the first fatality in 38 years, in a service which had safely carried thousands of passengers all around the world. Even modern aviation does not match this record. The following graphic demonstrates the far superior safety of hydrogen-powered cars, compared to those running on petrol/ gasoline. 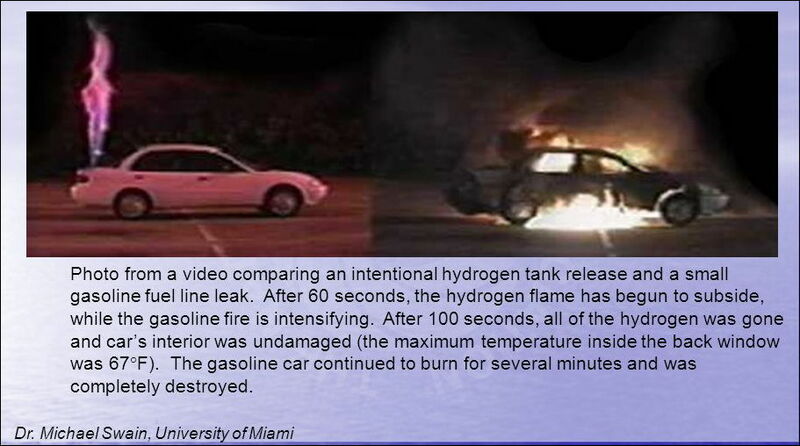 The hydrogen fuel burnt harmlessly, while the petrol car was completely destroyed. Figure HY400-Fnn. Relative safety of hydrogen and gasoline cars. From . A related article on this site, HY401: Hydrogen is Very Very Safe , goes into the safety of hydrogen in some detail. It shows, among other things, how difficult it was to shoot down the Zeppelin airships which raided London in World War 1. Considerations in near-term R&D When looking at ways to make widespread Hydrogen usage more efficient, there are some basic considerations and limitations to be borne in mind. Following are some factors, from . Storage. At room temperature and pressure, hydrogen's density is so low that it contains less than one-three-hundredth the energy in an equivalent volume of gasoline. In order to fit into a reasonably sized storage tank, hydrogen has to be somehow squeezed into a denser form. Liquefaction. Chilled to near absolute zero, hydrogen gas turns into a liquid containing one-quarter the energy in an equivalent volume of gasoline. The technology is well-proven. For decades, NASA has used liquid hydrogen to power vehicles such as the space shuttle. The cooling process requires a lot of energy, though -- roughly a third of the amount held in the hydrogen. Storage tanks are bulky, heavy and expensive. Compression. Some hydrogen-powered vehicles use tanks of room-temperature hydrogen compressed to as much as 10,000 psi (about 690 atmospheres). The "Sequel", which General Motors unveiled in January 2005, carries 8 kilograms of compressed hydrogen this way -- enough to power the vehicle for 300 miles. Refueling with compressed hydrogen is relatively fast and simple. But even compressed, hydrogen requires large-volume tanks. They take up four to five times as much space as a gas tank with an equivalent mileage range. Then again, fuel cell cars can accommodate bigger tanks because they contain fewer mechanical parts. Solid-State Storage. Certain compounds can trap hydrogen molecules at room temperature and pressure, then release them upon demand. So far, the most promising research has been conducted with a class of materials called metal hydrides. These materials are stable, but heavy: A 700-pound tank might hold a few hours' fuel. However, exotic compounds now being studied could provide a breakthrough to make hydrogen storage truly practical. "High-pressure tanks are a stopgap until we can develop materials that will allow us to do solid-state storage efficiently," says Dan O'Connell, a director of GM's hydrogen vehicle program. Research Needs The HydroSolar Package described above is possible with technology available today. Nevertheless, with Package implementation some areas of research and development would come into special prominence. One area is the development of small solid-state cells which, supplied with sunlight and water, would produce hydrogen under pressure to feed directly into the HydroWeb. Small users might expect to install small banks of these units, large users or power utilities might expect to install very large banks of cells, and continue to use existing renewable energy sources such as hydroelectricity and geothermal energy to bulk up inputs to the HydroWeb. How Close is the Hydrogen Economy? As of 2019, implementation of a hydrogen economy seems within sight. Continued improvement in solar energy capture and other renewable energy devices has brought the cost of this energy down to the same level as older technologies such as fossil-fuel fired power stations. A recent report from CSIRO, the Australian Government's Research Organization , notes that Hydrogen could become a significant part of Australia's energy landscape within the coming decade, competing with both natural gas and batteries. Here are some extracts from this report. "Hydrogen gas is a versatile energy carrier with a wide range of potential uses. However, hydrogen is not freely available in the atmosphere as a gas. It therefore requires an energy input and a series of technologies to produce, store and then use it". "Why would we bother? Because hydrogen has several advantages over other energy carriers, such as batteries. It is a single product that can service multiple markets and, if produced using low- or zero-emissions energy sources, it can help us significantly cut greenhouse emissions. Compared with batteries, hydrogen can release more energy per unit of mass. This means that in contrast to electric battery-powered cars, it can allow passenger vehicles to cover longer distances without refuelling. Refuelling is quicker too, and is likely to stay that way". The report also brings out the advantages of hydrogen for energy storage and for capturing excess renewable energy. "Hydrogen can also play an important role in energy storage, which will be increasingly necessary both in remote operations such as mine sites, and as part of the electricity grid to help smooth out the contribution of renewables such as wind and solar. This could work by using the excess renewable energy (when generation is high and/or demand is low) to drive hydrogen production via electrolysis of water. The hydrogen can then be stored as compressed gas and put into a fuel cell to generate electricity when needed". "Australia is heavily reliant on imported liquid fuels and does not currently have enough liquid fuel held in reserve. Moving towards hydrogen fuel could potentially alleviate this problem. Hydrogen can also be used to produce industrial chemicals such as ammonia and methanol, and is an important ingredient in petroleum refining". For those who believe in man-made greenhouse effects, hydrogen is the perfect answer, as it can be produced and used without any emissions of carbon dioxide or anything other than water. The report concludes by asking "Why embrace hydrogen now?". Figure HY400-Fnn. Implementing the Hydrogen Economy. From . "Our roadmap predicts that the global market for hydrogen will grow in the coming decades . Among the prospective buyers of Australian hydrogen would be Japan, which is comparatively constrained in its ability to generate energy locally. Australia's extensive natural resources, namely solar, wind, fossil fuels and available land, lend favourably to the establishment of hydrogen export supply chains". "Given its widespread use and benefit, interest in the "hydrogen economy" has peaked and troughed for the past few decades. Why might it be different this time around? While the main motivation is hydrogen's ability to deliver low-carbon energy, there are a couple of other factors that distinguish today's situation from previous years. 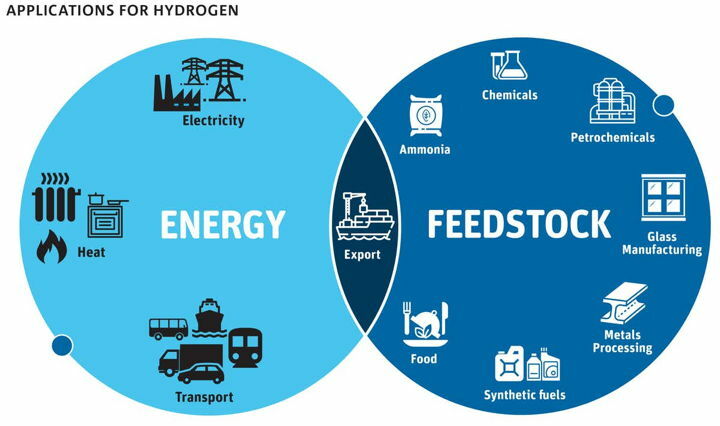 Our analysis shows that the hydrogen value chain is now underpinned by a series of mature technologies that are technically ready but not yet commercially viable. This means that the narrative around hydrogen has now shifted from one of technology development to 'market activation'." "The solar panel industry provides a recent precedent for this kind of burgeoning energy industry. Large-scale solar farms are now generating attractive returns on investment, without any assistance from government. One of the main factors that enabled solar power to reach this tipping point was the increase in production economies of scale, particularly in China. Notably, China has recently emerged as a proponent for hydrogen, earmarking its use in both transport and distributed electricity generation". "But whereas solar power could feed into a market with ready-made infrastructure (the electricity grid), the case is less straightforward for hydrogen. The technologies to help produce and distribute hydrogen will need to develop in concert with the applications themselves". So, the informed consensus is that the Hydrogen Economy is approaching reality more and more closely. As to the concern that hydrogen does not currently have a distribution grid like electricity, that concern is answered (and more) with the proposed Hydroweb. Blue-Sky Stuff The HydroSolar Package just described is capable of implementation using only today's technology. For those interested in more speculative possible advancements in this field, some ideas are collected in the accompanying article, Blue-skies thinking re the HydroSolar Package . Population and Energy Consumption. www.worldpopulationbalance.org/pop/energy/index.php . Record Demand Drove Energy Markets in 2004. www.bp.com/genericarticle.do?categoryid=2012968&contentid=7006684 . Green Heat and Power: Eco-effective Energy Solutions in the 21st Century. http://193.71.199.52/en/energy/report_3-1999/11167.html . Joseph J Romm. The Hype about Hydrogen: Fact and Fiction in the Race to Save the Climate. Island Press, Washington, 2005. [Calculations and data sources not explicitly given in this article are at: HydroSolar Calculations]. www.aoi.com.au/Calculations/HydroSolarCalcs.htm . Thoughts about Solar Towers, Promising new Energy Source from the Environment. www.aoi.com.au/pandora/frames5573.htm . The Chemistry of Water. http://witcombe.sbc.edu/water/chemistryelectrolysis.html . A Schematic Fuel Cell. www.princeton.edu/~chm333/2002/spring/FuelCells/what_is_fuel_cell.shtml . 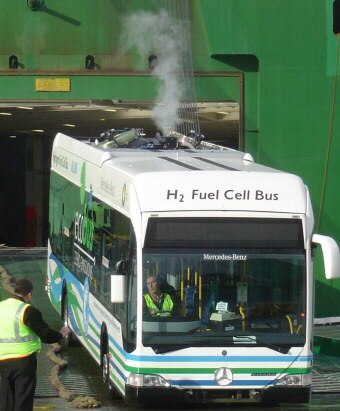 Perth Fuel Cell Bus Trial . www.dpi.wa.gov.au/ecobus/1206.asp . Jacqueline S. Mitchell. Hydrogen Myths. www.pbs.org/saf/1506/features/myths.htm . Dario Borghino. Record-breaking device uses sunlight to produce hydrogen at 15% efficiency. https://newatlas.com/hydrogen-panel-record-efficiency/58645/. Scientists find new way to produce hydrogen fuel from sunlight. http://sweetcrudereports.com/2018/04/30/scientists-find-new-way-to-produce-hydrogen-fuel-from-sunlight/ . Mark Halper. World's tallest building could be a 24/7 Australian solar chimney. https://www.zdnet.com/article/video-worlds-tallest-building-could-be-a-24-7-australian-solar-chimney/ . Blue-skies thinking re the HydroSolar Package. www.aoi.com.au/bcw/BlueSkiesHydroSolar.htm . Ford - P2000. https://www.allcarindex.com/auto-car-model/United-States-Ford-P2000/ . Neal E. Boudette. First Came the Hydrogen Cars. Now, the Refilling Stations. https://www.nytimes.com/2017/05/18/automobiles/wheels/first-came-the-hydrogen-cars-now-the-refilling-stations.html . Bhupendra Khandelwal. Hydrogen powered aircraft : The future of air transport. https://www.sciencedirect.com/science/article/pii/S0376042112000887 . David Noel. DS903: The KPW (Kilogram Power Wheel)	-- A domestic power storage device replacing batteries. http://www.aoi.com.au/devices/KPW/ . Jeff Wise. The Truth About Hydrogen. https://www.popularmechanics.com/science/energy/a926/4199381/ . EnviroMission building massive solar tower in Arizona. Video. https://www.youtube.com/watch?v=jKyDaWmiNiU . Solar Updraft Towers Generate Mega Power. http://www.solaripedia.com/13/371/5042/solar_updraft_tower_pilot_plant.html . Lorraine Chow. 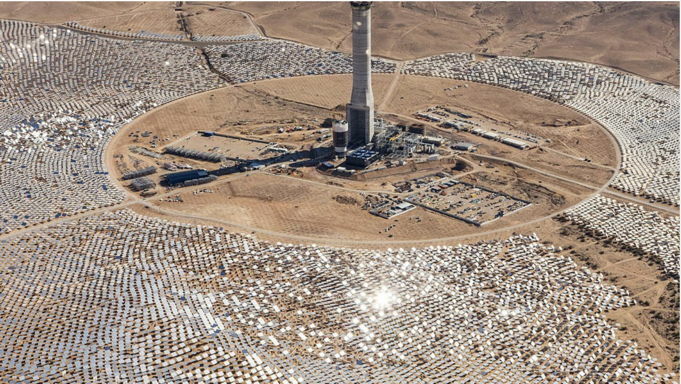 World's Tallest Solar Tower Could Help Make Israel a 'Sunshine Superpower'. https://www.ecowatch.com/israel-solar-tower-2180338497.html . 12 Countries Leading the Way in Renewable Energy. https://www.clickenergy.com.au/news-blog/12-countries-leading-the-way-in-renewable-energy/ . How hydrogen power can help us cut emissions, boost exports, and even drive further between refill. https://theconversation.com/how-hydrogen-power-can-help-us-cut-emissions-boost-exports-and-even-drive-further-between-refills-101967 . David Noel. HY401: Hydrogen is Very Very Safe. http://aoi.com.au/Hydrogen/HY401/ .